Fife Flyers' captain Justin DaCosta hailed the contribution of team-mate Tim Hartung as the Kirkcaldy men moved off the bottom of the Elite League. Saturday's penalty shots win over Hull Stingrays was followed by a 7-4 victory - including a stirring third period comeback - at Coventry Blaze. And DaCosta revealed coaches Todd Dutiaume and Danny Stewart earned their corn, with the side trailing 4-2 at the Skydome going into the final period. "Dutes and Stewy both came in at the second period and told us get the pucks deep and the chances will come," he said. "We did the same thing against Hull on Saturday when the game went to penalty shots and Tim Hartung was a huge player for us. "His penalty gave us the win then and he came up with the vital equaliser for us in Coventry and that drove us on. After that, it's going to be a better week ahead for us." The Flyers had to dig deep on Saturday after Jordan Fulton, DaCosta and Kyle Haines cancelled out Hull's goal to send the game beyond regulation time after a 3-3 draw. A marathon penalty shots session ensued with both teams needing nine attempts until Hartung's finish proved decisive in the end. On Sunday, Bobby Chaumont's hat-trick was a big factor as the Kirkcaldy men posted a double points weekend for only the second time this season. Coventry led after two periods through an Ashley Tait double and single goals from Mike Egener and Ryan Ginand, despite Derek Roehl and Chaumont replying for Fife. A five-goal salvo in the final period saw Steven Gunn, Hartung, another from Roehl and Chaumont's brace take the points. They now go above Edinburgh Capitals, whose recent resurgence came to a halt as they ended a weekend without a point for the first time since October. The Murrayfield side went down 6-3 at Belfast Giants on Saturday with Jan Safar cancelling out Adam Keefe's opener, but the Giants had roared into a 6-1 lead in the third period. Late strikes from Michal Benadik and Richard Hartmann proved consolations as the Caps returned to Scotland with a loss. 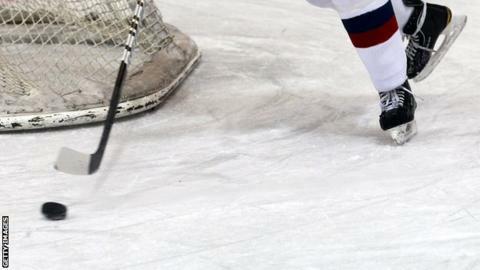 However, Hull Stingrays made up for their loss in Fife the night before by beating Edinburgh 5-4 at Murrayfield. Jason Silverthorn, Kyle Mariani and two from Jereme Tendler gave Hull the lead, despite Martin Cingel, Tomas Horna and Curtis Leinweber scoring for Edinburgh. But Guillaume Doucet fired home what proved to be the winner for Stingrays, despite a late strike from Horna late in the final period. Dundee Stars had only the one game and although they left Cardiff Devils with a loss, they got a point in a penalty shots defeat by the Welsh side. Two each from Cardiff pair Tomas Kurka and Max Bribraer and Dundee's Jeff Pollastrone saw the score at 4-2 after two periods. Nico Sacchetti drew the Tayside men level before Pollastrone completed his hat-trick, taking the game beyond regulation time. But Jake Morrissette's decisive penalty shot proved to be the difference. Braehead Clan, who had Sunday off, earned three points from four after an overtime 5-4 loss to Nottingham Panthers on Friday and a crushing 8-4 over Cardiff on Saturday. The games marked the return of captain Ash Goldie, who scored two in both games.